How do the signings work? It’s so easy! Simply show up to the store (we suggest a little bit early) and purchase the comic book(s) or items you would like to get signed. Once you have those, you can jump on the line that forms outside the store. There, you will receive a ticket. Once the artist is ready, we take the first part of the line up into the store to wait inside. There, you can un-bag and un-board your comics so they are ready to be signed! When you reach the front of the line, a Midtown employee (most likely me!) will take your ticket and hand you Midtown Comics Certificates of Authenticity. When it’s your turn, head up to the creator table and VOILA! They will sign your books or items! Easy, right? We try to run our signings at hours that work best for our customers. Normal signing start time is 6pm and it runs until the store closes at 8pm. However you should always check our Facebook Events page for every event to make sure that this is the scheduled time. We suggest you show up a little bit early, particularly for the higher volume, busier signings. This will ensure you get your item signed as quickly as possible. The line typically wraps outside. This means the closer you are to the front of the line, the less time you have to stand out in the cold. If you haven’t purchased a comic from us to be signed yet, make sure to show up a little bit early to make your purchase! 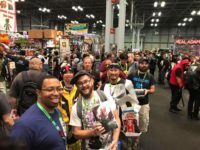 How much does a Midtown Comics signing cost? We don’t charge for the signature itself, unless you choose to do CGC (have your comic sent out to be graded.) In this case there is a small creator fee that varies for every guest. Instead, we require that you purchase 1 item from the store to be signed. It could be a comic from the creator (perhaps a Midtown Exclusive variant cover), a POP or figure of a character the creator worked on, or even a piece of apparel! How many items can I get signed? You can get up to 3 items signed. If there are multiple creators, it is 2 from each creator. For those who want additional items signed, if there is time permitting, we will allow customers to get their first set of items signed, receive another ticket and hop back on the line for those extra items. What kind of items can I get signed? We only require that you purchase 1 item from the store for the signing. Although technically it doesn’t have to be one of your items signed if you already have things you had in mind. The other two items you can purchase from us as well or bring something from home- it’s entirely up to you! As long as it has a sign-able surface, and a link to the creator signing it, anything is game! Typical signed items include comics from the creator, variant covers from the creator and POP’s! But I have also seen some great atypical items signed like folios, purses, baseballs, art books, hats, posters, utility belts and tablecloths! While we don’t encourage you to get too creative, we suggest finding items that have value to you! 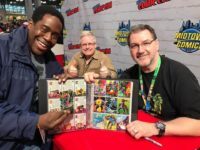 Fans show off their Marvel Masterpiece cards to artist Joe Jusko to get signed! What kind of guests do you bring in for signings? Anyone related to our business, and most importantly, guests that have value to YOU! We’ve had comic book writers and artists like: Scott Snyder, Francesco Mattina. We also bring in musical artists like Lights, authors, actors, and voice actors. If there is someone you would love to get into the store for a signing, reach out to us on social media and let us know! Do I need to sign up? Is there limited space? There is no sign up. The only limitation we have for the majority of our signings is a time constraint. This is because most signings only run for 2 hours. We try to keep things moving faster for larger signings to ensure as best we can that everyone on the line gets into the signing. Where is the Midtown Comics Downtown store? Midtown Comics Downtown is at 64 Fulton St, New York, NY, near the corner of Gold St. It is easily accessible from the 2, 3, 4, 5, A, C, J, and Z trains from the Fulton Street Station. Can I get sketches/commissions done? This depends on the artist at the signing, and the number of people waiting for the signing. Some artists are willing to do sketches for an extra fee. Some will do them for no fee. Some won’t do them at all. Sometimes one of our guests will be willing to do sketches, but the line and time constraints don’t allow for it. As a rule, it’s best to ask one of the Midtown Comics employees at the store at each signing for details. Can I take a photo with the guests? I can’t give a definitive “YES” to this question because it depends on the creator. However, most signings guests we have are more than happy to put a grin on and get cozy for a picture. As always, it’s best to ask one of our Midtown employees for a swift and accurate answer. Do you offer CGC or other grading services? Yes! Midtown Comics is now offering in-store CGC to have comics signed at our signings graded and sealed for collectors! As a service which is almost exclusively reserved for convention attendees, we’re excited to bring this opportunity to our Midtown customers! Our store now has a CGC expert on hand and a CGC witness to facilitate yellow label Signature Series books. There is an additional fee for CGC. These include an artist, processing and shipping fees. But we’ve got an expert on hand to walk you through it! Don’t miss out on this rare opportunity to have your signed books sent to be graded and sealed! It’s a collectors dream! Not sure if you want to dive into CGC? Stay tuned for next week’s post where we break down all your CGG Questions, concerns and give you the answers and information you crave! Well that’s all I got folks! As always, for any additional questions, concerns, suggestions which we didn’t cover here, feel free to reach out to us through our social media platforms! Find us on Facebook, Twitter and Instagram! We’d love to hear from you!